My dream last night: I was back on the mission (I have these dreams surprisingly a lot), but we were living in my house (except not really, it was kind of a combination of the East Pointe Cherry Grove apartment and my house), and the assistants shared the house with us. I was doing something or other, and it was past bedtime, but I wanted to finish whatever it was, so if anyone asked me, I was going to use the excuse that I didn't remember that bedtime was 10:30 because I just came back to the mission. 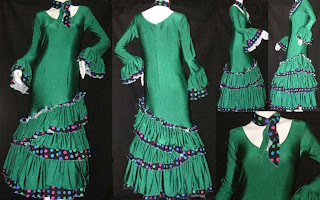 I was for some reason on the floor in the assistants' room around midnight, trying not to be seen while doing something important, when I heard some rustling and looked up to see Elder Poulin wearing an emerald green Spanish flamenco dress and heels, twirling around and clicking his castanets. Later, my mom popped out of hiding and threw socks at me and I screamed. I would love to see a man in that dress. Are you volunteering? this dress is totally unexpected eye-wise. a nice visual treat, then.